At the various House of Tiles tile shops around Dublin, you can find a wonderful selection of bathroom tiles, wall tiles and floor tiles that bring out the best in kitchens and bathroom suites all across Ireland. There’s so many styles, shapes and sizes on offer that it can make your head spin, but luckily our helpful, knowledgeable staff are on hand to make finding the perfect choice a simple process. Today we look at the wonderfully ornate Stamford range of ceramic tiles that feature fine, intricate designs and patterns of quite stunning beauty. Created with a gorgeous blend of soft cream, olive green and cool blue tones, they offer an authentic and distinctive encaustic aesthetic. Typically speaking, encaustic tiles (traditionally created using coloured beeswax) can cost a pretty penny, but thanks to modern inkjet printing technology, their attractive qualities are available for a cost suitable for even the most conservative of home DIY budgets. 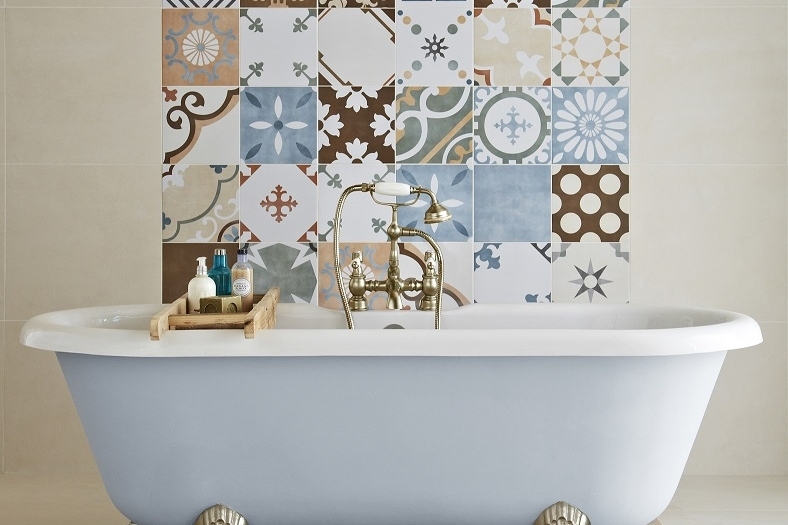 The designs featured on Stamford ceramic tiles offer a quirky, but homely look with a style akin to a patchwork quilt. When installed with traditional or modern kitchen or bathroom designs, they provide character that’s uniquely yours - as no two arrangements have to be the same. Seeing, as they say, is believing, which is why we encourage you to come and take a look at our tiles for yourself, as it’s the only way to really to fully appreciate the craftsmanship involved. Our showrooms are easy to find and to locate the one closest to you, simply visit our website www.houseoftiles.ie where you’ll also find our many items from our ranges of ceramic and porcelain tiles. Alternatively, if you can’t find the time to come and see us, you can still get advice and guidance on our extensive range of products by calling us on 01 426 4881. Thanks for reading our blog. We’ll be back soon with more from the world of quality tiles.